Our newest radar simulation is approaching completion, and should be available for purchase by the end of July 2012. We have decided to offer six different levels, instead of four as originally intended. Radar Chaos Hawaii Edition consists of two ‘enroute’ levels and four ‘TRACON-style’ levels. You have seen airport environments in our earlier radar games, Radar Chaos, Air Traffic Controller, and The Simulator. In these levels, aircraft land and depart from busy airports. Hawaii Edition’s two enroute levels offer something a bit different. These sectors have no airport. They are designed to collect arrivals and stream them to the ‘approach’ controller for a specific airport. They also disseminate departures to their correct flight routes. There are many conflict points, and an understanding of the airspace shape is required. In some areas, you are in charge of only the airspace that lies above 16000 feet. In some ways these levels are far more complicated than the approach TRACON’s. We’ve fallen behind. The original promise was for July 1. However, we’ve expanded the project, by adding levels and features. We’ve run into challenges that eat up time. And, the Well of Inspiration does occasionally dry up. Some days this project feels like a concentration camp of the mind. We love it, though. And like the rest of our games, we poured our hearts into this one as if we were building it for ourselves to play and enjoy. RCHE will definitely ‘bring it’ on release day. As with the original Radar Chaos, we ran into this issue of ‘what’s going to be fun’ versus, ‘what’s going to be real’. We could make it more realistic but it would become too complicated for most, and the instructions would be lengthy. At the end of the day, a simulation that is dead real isn’t going to interest the majority of our customers. If we really wanted, we could add multiple SIDS, assignable STARs, VFR climb restrictions, non-radar separation, and flow control. I’ve done this stuff in real life, and trust me, it gets boring. The fun stuff is the vectoring, the sequencing, the handling of six aircraft that are all tangled together somewhere. An arriving Cessna that’s getting overtaken by a B757, that’s fun. A departing 737 that is stuck beneath a slow-climbing prop, that’s fun. These are situations where you get to put your ATC cap on and do some air traffic controlling. It’s crazy scenarios like these that make the work interesting. Nobody enjoys relaying IFR clearances, coordinating time estimates to adjacent sectors, or talking on the phone with the flight planning. So we are building something that will ultimately be a whole lot of fun, in risk of offending a few real-world air traffic controllers who will immediately recognize that this is not an exact replica of real-world ATC in Hawaii. We should hopefully have another video up shortly. If you haven’t watched the first one you can find it in our blog below. This entry was posted in Uncategorized on June 27, 2012 by admin. Shortly after we finish Radar Chaos Hawaii Edition next month, we will be pushing out a new version of Sky Madness as well. Better graphics, improved game play, and way more levels! Radar Chaos: Hawaii Edition Teaser! This video isn’t the best quality, but it gives you an idea of what we are working on. Radar Chaos Hawai Edition: Part 1 from Big Fat Simulations on Vimeo. We’ve released yet another update to Airport Madness 4 which you can grab here, free to existing owners of this product. New challenges have been added, my favorite being “Fast Forward”, which speeds up the game play to 2X speed. I actually found it to be more fun than the core game itself, which suggests something. With the first version of Airport Madness, there were complaints that players were not being given enough time to react. It’s a real-world problem as well, but nevertheless, I changed future versions of the game to be more ‘zoomed out’ with smaller airplanes, offering plenty of time to react. But I think the game lost something when I did that. The next version of Airport Madness has a bizarre theme which I’m very excited about, but it will require that I ‘zoom back in’. Airport Madness was never a simulation, but all game. I’m striving to keep it there, in risk of disappointing those who want ‘more features’. I received a great email from someone the other day who feels that Airport Madness has become a big tangled ball of yarn. In Airport Madness 4 there are different user profiles to choose from. And you must pick a name. And there are challenges and different levels. But the levels must be unlocked. And what’s the trophy case all about? With each version, we experiment with new stuff. The stuff that works gets added to future versions. Everything else gets cut. The next version of Airport Madness deserves a better name than ‘number 5’. I think we can do better than that. After all, it’s going to have an entirely different feel to it. It practically deserves a new name altogether. We will have to see. I don’t think anyone’s going to by ‘Airport Madness 17’ if they already own the first 16 versions. Realistically there are at least four variations on the Airport Madness theme that I would like to try. Needless to say, we will be keeping ourselves very busy for the foreseeable future, not just with Airport Madness, but the Radar Chaos series, which will likely have several future versions of it’s own. 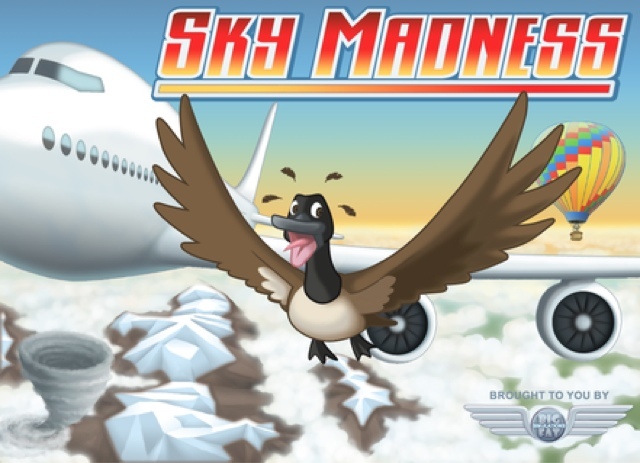 Sky Madness will also be getting an overhaul this summer. If it makes a decent comeback, there could be future versions of that as well. I hope to soon find time to try something entirely different. I think there are untapped ideas in flight simulation, which seems to have kind of disappeared over the last few years. You can read about it all here first. I will do what I can to keep everyone posted!